Rooftop Solar: The Next iPod? I still remember the first MP3 player I touched – it was the size of a fat sandwich and six times as heavy, with clunky rubber molding and a dim, finicky screen. It only held a couple hours of music. Why would anyone want one of these? And then Apple released the iPod and changed – forever – the way we listen to music. But the change didn’t happen right away. We resisted. The iPod was slick, and we all wanted one, but it was expensive, only for diehard Apple-heads. 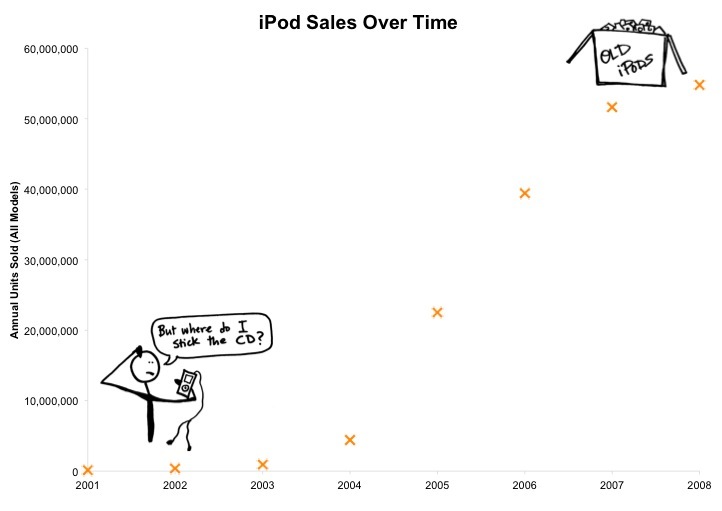 It took several years for the iPod to really take off. 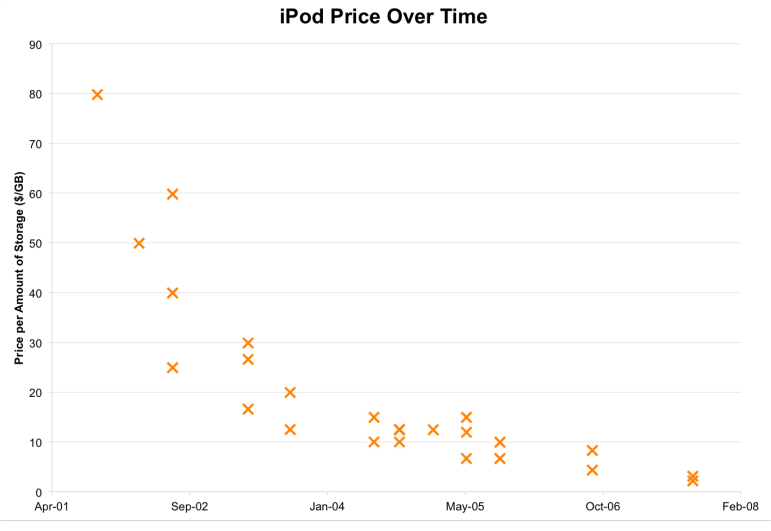 The price of an iPod, in terms dollars you paid per unit of storage, dropped sharply after the release of the first model in 2001. Data source: Brian Ford, Newsvine. By 2008, the iPod had jumped from 125,000 sales annually to nearly 55 million. Data source: Wikimedia Commons, compiled from Apple annual reports. By the time 2008 rolled around, we were ready for the next disruption: Smart phones began cannibalizing the sales of MP3 players, and we’ve never look back. 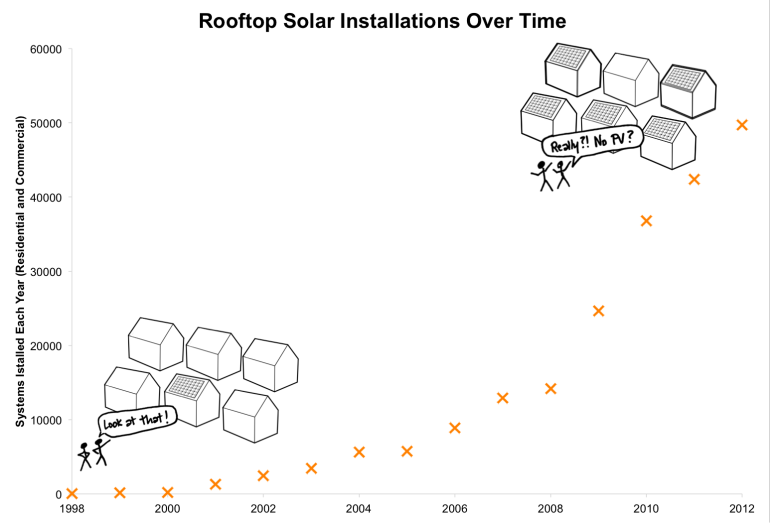 Could rooftop solar panels be ready for a similar tipping point? 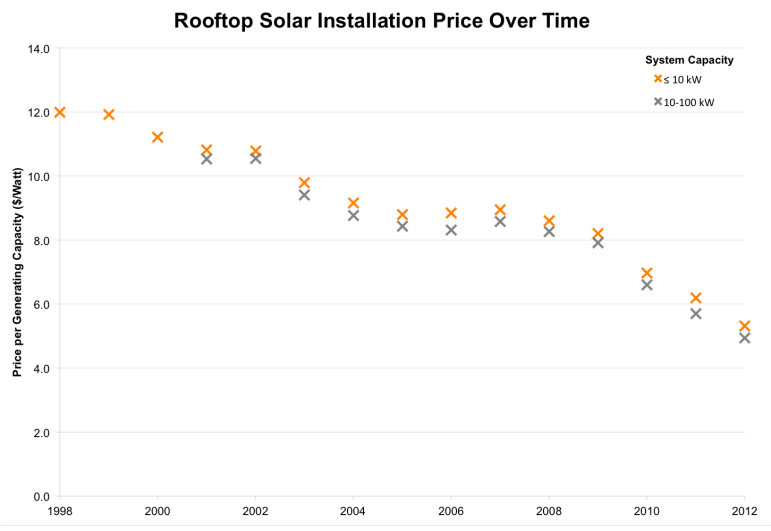 Today, the price per watt of a rooftop solar system is half what it was 10 years ago. Data source: Lawrence Berkeley National Laboratory. Solar installations have skyrocketed in the past few years, but there are still only several hundred thousand residential systems nationwide. Data source: Lawrence Berkeley National Laboratory. 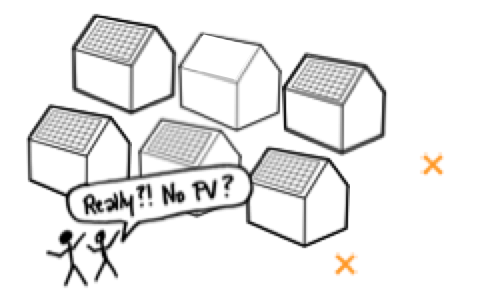 Solar panel house icon designed by misirlou from the Noun Project. But Kegler thinks that’s about to change. “I think three years out, if you build a new house in America and you don’t put solar on that house, that same group of friends, family and neighbors is going to say, ‘What happened, why don’t you have solar on that roof?’” Kegler said. Of course, Kegler installs solar panels for a living, and has reason to be optimistic. Keep in mind, although solar is growing rapidly, it’s still a tiny part of our electricity infrastructure – only a quarter of a percent of U.S. homes have solar panels on their roofs. And solar panels aren’t, and never will be, iPods: The energy and entertainment industries operate under different economic, political, and social influences. But whether or not rooftop solar is the next iPod, it is already reshaping the way our grid works, and the way everyone from small rural towns to national-scale utilities and power companies are thinking. As oil booms in North Dakota, the rate of spills has been growing, Emily Guerin reported. Thousands of barrels of oil spill each year, but something more dangerous comes with it: saltwater. A by-product of oil extraction, saltwater can destroy farmland for years. Finding detailed data on saltwater spills – more than 800 happened in North Dakota in the past year – was hard. Really hard.